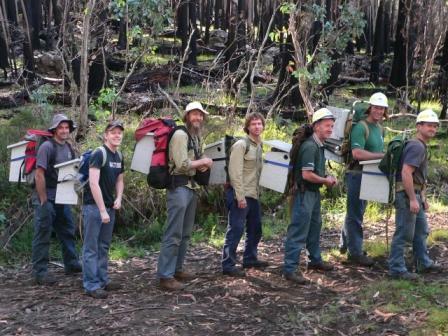 Post 2009 Bushfires Nest Box installation and survey of the survival of Leadbeater’s Possum at Mount Bullfight Nature Conservation Reserve. Leadbeater’s Possum (Gymnobelideus leadbeateri) is the only Australian mammal restricted in distribution entirely to Victoria. It was not sighted for over fifty years and presumed to be extinct until its rediscovery in 1961 in the montane ash forests of the Victorian Central Highlands. The species is currently listed as endangered under both state and commonwealth legislation, and is predicted to undergo population declines of more than 90% over the next 40 years. To further exacerbate their predicament, the Black Saturday Bushfires in February of 2009 burnt through approximately 43 percent of the known home range of the species at varying fire intensities. Mount Bullfight Nature Conservation Reserve, the focus for this project, is 676 hectares in size, and situated around 7 km north-east of the Lake Mountain plateau, within the Central Highlands region. 98% of Mount Bullfight NCR was burnt through on Black Saturday but importantly at a lower intensity than Lake Mountain. 95% of Lake Mountain Plateau was burnt at high fire intensity. Most of Mount Bullfight was burnt shortly after Lake Mountain, although many of the pockets of rainforest in deeper gullies and small areas of Snow Gum in sheltered aspects escaped relatively unscathed. The large size of some old Snow Gums suggests that many may have also escaped the 1939 fires. On the upper slopes, perhaps less than 50% of the Eucalyptus pauciflora (Snow Gum) forest canopy was scorched and given the reserve shares floristic affinities with Lake Mountain, such as their adjacent location, similar height and identical geology, it is reasonable to anticipate that Leadbeater’s Possum’s will have also survived at Mount Bullfight NCR. Very little is known about the Leadbeater’s population at Mount Bullfight NCR but the species was confirmed present in the reserve as recently as 2008. We anticipate that, as at Lake Mountain, many of the natural hollows are likely to have been destroyed and the understorey has been greatly reduced. This project will enhance habitat suitability for Leadbeater’s Possum post fire by identifying suitable areas of habitat within the burnt zone at Mount Bullfight NCR and addressing hollow shortages in these areas. This will in turn reduce further population declines post fire and assist in estimating the size of the surviving population. Intensive ground-truthing, spotlighting, call imitation and the use of remote video surveillance cameras will all be employed to establish where the species has survived and how it is faring. Site selection for boxes will target habitat that is still suitable post fire (still green or low intensity fire experienced) but has depleted numbers of available hollows. Approximately 30 boxes have been installed and all surviving animals will be monitored. It is anticipated that this will be a long term project (10+ years) and may involve shifting of sites until boxes are known to be of ecological use to LBP colonies. 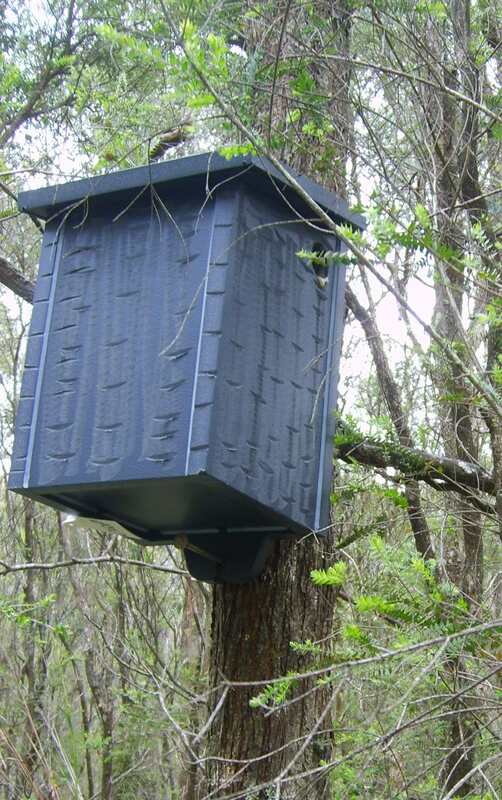 Given the protracted period of hollow shortages facing Leadbeater’s Possum, considerable research and development has been undertaken to design and construct nest boxes from long lasting products, namely recycled plastic, with a predicted longevity of approximately 40 years. Trials have already confirmed that Leadbeater’s will readily occupy them in the field with very careful site selection. Site assessments at Mount Bullfight were completed in November 2009 and the nestboxes installed in February 2010. Nest boxes will be monitored twice per year – November/December and April/ May. Nest Box checking in April 2013 provided some promising data. Nestbox installation team at Mt Bullfight. PHOTO. Thanks to Dan, Darren, Steve, Sean, Lachie, Dave, Gary & Jo from PV (the photographer) for an outstanding effort! After two years, boxes that show no sign of use may be relocated to new areas to ensure that a high rate of occupancy is achieved. The presence of a Leadbeater’s Possum nest in a box will be used as evidence that the box has been located by a colony, and taken to indicate a willingness to use it should no alternatives exist. Initial inspections of boxes in April 2010 shows promising evidence of LbP’s at Mt Bullfight. This project does not involve any animal handling or examination. Nest box inspections will be conducted simply to determine whether possums are present or have constructed nests in the boxes. Two other non-invasive techniques will be incorporated into the overall monitoring program: stagwatching and call imitation. Stagwatching (observing possums emerging from their den at dusk; no lights are used, instead observers rely on detection of silhouettes evident under natural fading light at dusk) will enable the number of possums denning in a nest box to be determined and for still standing natural nest trees to be surveyed and assessed for possum presence. Imitating the call of Leadbeater’s Possums frequently elicits a vocal response, and provides a method of confirming whether possums still occupy a site should they no longer be denning in a nest box. A video surveillance monitoring camera may also be used in the field to assist in determining colony numbers, animal movements and foraging behaviour. Lifting the hinged nest box lid permitting visual inspection of the box contents. If nest material is present, the nest chamber will be checked by hand (feel) for the presence / absence of animals. Any possums occupying the nest box at the time of inspection will NOT be removed or handled. Box checking will take about 4 minutes. Stagwatching. Where possums are denning in a nest box on the day of inspection, it may be stagwatched at dusk that evening to establish colony size. Observers will be positioned near the base of the nest box tree and count the number of possums that emerge naturally at dusk. No lights will be used or noise made during the stagwatch. Each of the procedures outlined above are commonly used in field studies of arboreal mammals. The above protocol follows that used to monitor the Leadbeater’s Possum population at Yellingbo between 1996 -2007, and in the Central Highlands from 2000 to the present, without any obvious adverse effects. All personnel involved in box inspection have extensive experience with each of the techniques described. These personnel will also oversee any volunteers used for stagwatching. The project will be a collaborative effort involving Parks Victoria, Dr Dan Harley, Department for Sustainability and Environment, Friends of Leadbeater’s Possum, the Field Naturalists Club of Victoria and Mount Bullfight Ski Club. Fire recovery efforts for Leadbeater’s Possum have been underway since mid February 2009 and have attracted significant media attention including Channel 10 News, ABC Stateline, ABC Natural History Documentary division (ongoing 12 month filming program), The Age, ABC radio, local papers, Parks Victoria and Department of Sustainability and Environment publications and other publications and public presentations. Healesville Sanctuary (Zoos Victoria) and Melbourne Museum have also been supportive of the species and have fire recovery displays relating to Leadbeater’s Possum. We wish to acknowledge the very much appreciated support from Conservation Ark – Zoos SA and the general public of Adelaide and South Australia. Our heartfelt thanks! For further information on this project, please contact Joanne Antrobus from Parks Victoria on 9760 1502.